This inflatable game is popular with kids (8 and older) and adults alike. 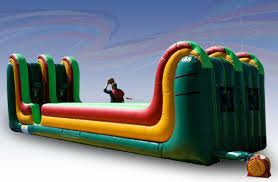 Jump and Slide Atlanta'slane inflatable bungee run basketball will keep your guests moving. The object to the game is putting on your vest that is attached by a strong bungee cord. Then seeing how strong you are by running down Bungee Run and attempting to make a basket with the basketball. Then getting pulled back like a rubber band to the starting point. This is a great challenging inflatable activity and is great for festivals, school events, religious events, family reunions, company parties and picnics.